The 300 year old buildings of Le Roudier stand in over 30 acres of glorious perigordian countryside with fantastic panoramic views across the adjoining valley. The splendid southfacing fenced 14 ;— 7 m roman ended swimming pool forms the centre piece of this fabulous farmstead and the surrounding 300 sqm terrace provides the perfect platform to relax and take in the sights and atmosphere of the Dordogne landscape and diverse wildlife. The old bakehouse to the eastern end of the terrace has a summer kitchen, games area and self service bar which serves as an ideal shady retreat when the midday sun gets too much. There are children's swings, table-tennis area and many more games to keep the younger guests occupied. 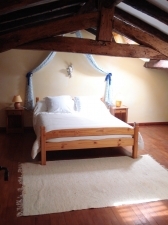 You can choose from 4 cottages and the main farmhouse at Le Roudier which can cater for individuals and/or larger groups depending on your particular requirements. Double doors from private terrace to large and airy fitted kitchen and dining area, with dishwasher, washing machine, fridge, microwave, gas hob and electric oven. 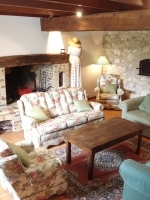 Large lounge with old stone walls and beams. Satellite TV. Bedroom with 1 double and 2 single beds with built-in wardrobes. Bathroom with wash basin, w.c. bidet and bath with shower. 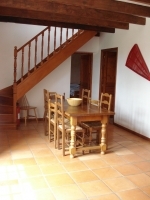 Twin bedroom, double bedroom, shower room with wash basin, w.c. and bidet.